Organic Marketing or Search Engine Optimisation has always been an important and integral part of digital marketing efforts for any brand, product or company. Especially, when it comes to traffic maximization in the long term, SERP rankings and understanding the user behaviour, SEO has been the go-to strategy for marketers. But lately, companies and marketers have broadened their expectations in terms of lead generation and revenue optimization. The power of Search Engine Optimisation is not only limited to improvements in organic traffic and rankings but can prove hugely beneficial in organic revenue and lead generation with strategic planning and long-term branding exercises. Also, with the advent of Local SEO and Mobile (Voice) Search, bold and brilliant SEO strategies have been able to convert traffic into money numbers. But, how does SEO help in garnering organic leads and revenue exactly? SEO efforts increase your website rankings in Google SERPs, which in turn brings traffic to the website when people search for keywords which are related to your product/website and for which your efforts have been aligned. The website traffic can be your potential customers when they interact with your website and engage with your content. If the audience like what they see, you have the chance to convert those visitors into leads and eventually sales. Hence, content, be it on the website (on-page SEO) or the internet (off-page SEO) as a means of engaging and converting the audience into leads is very important and should be considered as one of the priorities. SEO can act as a map or funnel which brings a bunch of leads to the website and through appropriate checks and balances (read: Goal settings and benchmarks), those leads can turn into conversions. This can make your website as one of the best lead generation tools for deployment at no extra cost but only quality and strategic content. To make the most of this, quality content needs to be created, which can be valued by search engines and searchers alike. 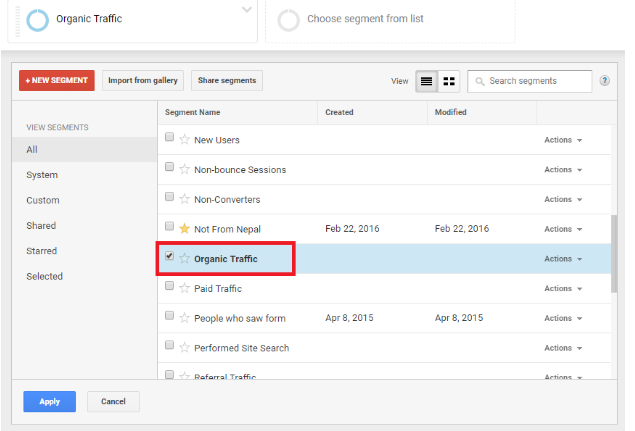 Google Analytics can be considered as a data mine in simplest terms. It has so much to offer and in such a processed manner that any and every kind of bucketed funnels can be created to gain insights. From website traffic to visitor behavior to demographic analysis, most of your analytic needs can be sufficed by Google Analytics. What is needed is a clear understanding of metrics that you want to consider. Starting with website traffic, a marketer can then move on to building user personas, geo-targeting and much more. Now that the data analysis with Google Analytics has been understood, it is time to identify your goals. What exactly do you want your visitors to do after coming to your website in terms of interaction and engagement should be discovered and set up under Goal Settings in GA. This will help in reflecting and quantifying the results of user engagement. CTR plays an important part in maintaining organic rankings as Google algorithm takes into account the Click Through Rate of every ranked website to determine the level of engagement vs the impressions. To optimize the CTR, the webpage targeted for a keyword should have appropriate Meta tags and engage enough to compel the audience to click on it.